Discussion in 'College Football & the NFL Draft' started by Texansphan, Dec 30, 2018. He likes Isaiah. I was saying not fond in the 3rd. In the 5th sure. As I said, his change, both speed & direction, is lacking. He ran a 4.40 at the combine, he's not slow. Did I say slow? No, I said his change of speed is lacking. There's a term in physics for it few are familiar with, jerk. Acceleration is the rate of change of velocity. Jerk is the rate of change of acceleration. So how fast can you go from steady to full bore? Jerk is somewhat euphemized as closing speed. Your top end doesn't matter as much as standing to full bore. I like Isiah a bunch. I would take him at 55 but would be really happy with him at 86. Big tall rangy CB who's really fast, plus he's only played CB for 2 yrs. His best football should be ahead of him. What dont you like about him? Not to mention.....Isaiah Johnson isn't afraid to lay the lumber. I like this fact almost as much as I like his size and speed. His upside as a RD3 pick will be worth the investment. From what I saw and his 3 cone/short shuttle times seem to say he's got great short area quickness for a man his size. BTW, these are the reasons I absolutely love David Long. Awesome short area quickness. I would have no problems at all if Gaine drafted a couple of OL and Long/Johnson with his 1st 4 picks. infantrycak and HaveMercy like this. Jamel Dean, Auborn, CB. Really like in 3rd, given our late 2nds, ok there. Press guy with speed to stick. Kendall Sheffield, Ohio St., CB. As a slot really like in the 5th, like as a trade into the 4th, wouldn't kick the neighbor's cat in the 3rd. RBs are an exception to my dislike of scales & tape measures but it is contrarian: I like low center of gravity, low & solid. Jacobs would have to be a 1st. David Montgomery, Iowa St., RB. Solid 2nd. Not going to pull a Dorsett 99 yd TD but will get what's there, create some & be a safety outlet. Wish Miles Sanders, Penn State, RB had more pass catching film but 2nd ok, definitely 3rd. Less interested if move to more ZBS which I think we should. Damien Harris, Alabama, RB. 3rd, not going to complain too much in 2nd. Sanders is going to be a really good complimentary RB. I like Harris and Montgomery. There's a good chance 1 of these guys will be there in the 3rd. Maybe... Or the draft could easily go like this. Right now the Texans Don't have a single RT who they can count on, and its likely that every CB on the roster this year is gone next year except for maybe 1. Roby's not good? 15 starts 50 tackles 15 pdef and an INT; if you say things like that you quickly lose cred. I do agree Joseph could be gone but he has shown little to indicate it. If he has another good season, I could see another extension at reasonable $ while he starts and grooms a youngster or is a quality backup. Roby's not good? 15 starts 50 tackles 15 pdef and an INT; if you say things like that you quickly lose cred. Roby got abused as an outside CB last year. On 900+ snaps he allowed a 66% completion percentage and QB's had a rating of 117 when targeting him. He gave up the 4th most yards among all CB's in the league last year. AngryNateFTW, steelbtexan and bah007 like this. You need to research a bit more; he had ACL in week 10 which really impacted his play that you refer to. The Texans' river poker bet is all will realign for Roby who if healthy should be a lockdown corner for one season before going to get his reward elsewhere. Roby graded as the 2nd worst player in the league in week 9, had a 55 grade through October, and finished with a grade of 59 (all by PFF). Only injury I remember him coming back from is an ankle toward the end of the year. Regardless, his play was sub-par all season. There's a reason the Broncos didn't try to re-sign a 26 year old former 1st round pick. steelbtexan and bah007 like this. Yep and it was cost vs risk of health and age. I may have not re-signed him either but that isn't the question. Is he worth $10 m to Houston? I say yes. You say no. Preach on to the unwashed. Good to see Bah's checking in. I would love to hear his thoughts on this draft class. No worries....in RC's defense he ensures that his CB's have a 15 yard head start on every snap....even on 3rd and 3's. Have any of you guys evaluated Bobby Evans-OT from Oklahoma? I watched a little film on him and came away with mixed feelings. In the run game I think he can be a stud, no issues, but in pass protection he can sometimes be late off the snap, a little slow footed, and needs to bend his knees more. I wonder if the late snap and slow footed issues are just physical conditioning issues. He looks good but with issues that would seems to be easily coachable. Opinions? This is what I see. He's not good enough in pass pro to be a LT. But could be a serviceable RT. OU OT's have a history of being successful in the NFL. Give me Edoga/Scharping over Evans. OptimisticTexan, otisbean, JB and 1 other person like this. Why do you have Greg Little behind Kaleb Mcgary? 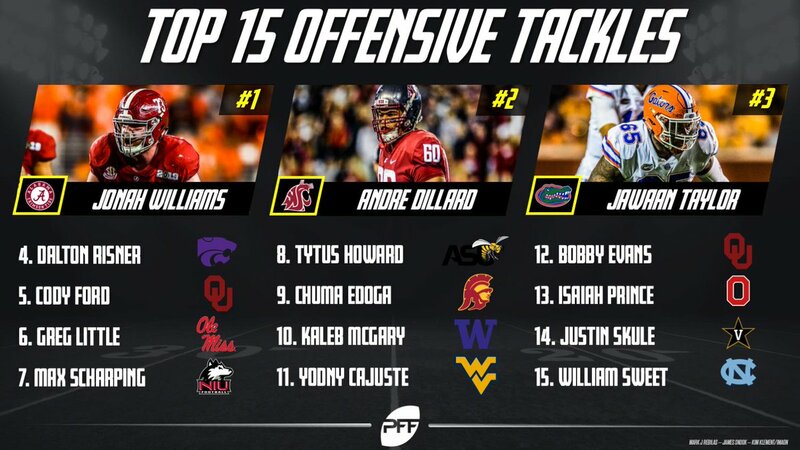 No Jonah Williams-OT on your list? Wolf6151 and JB like this. He has him as a guard. The LT I want....Dillard will be gone before the 12th pick, at least that's my call. I also fully expect OB and Devlin to give Davenport this season to prove he was worth the investment.....but they also sign Khalil as insurance if their faith doesn't pay off. With this.....I want the Texans to make a strong run at Mitch Hyatt if he's still on the board in RD5, this is where I really miss having that RD4 pick. Anyhow, Hyatt had a stellar 4 year run at LT while protecting Watson, Kelly and Lawrence. His 4 year tenure saw Clemson play in 3 CFB Championships and walking away with 2 trophies. Both Watson and Lawrence are and will be considered top franchise QB's in the NFL. Hyatt faced great defensive talent that will be taking or have already taken their talent to the NFL. He did this consistently over his 4 seasons and Clemson's QB's enjoyed tremendous success. If the Texans can gain him in RD5.....it'll be a steal and a tremendous insurance policy for both Davenport and Khalil. steelbtexan and TheRealJoker like this.